Ricoh's range of digital color production systems has been broadened by the launch of the Ricoh Pro C901 Graphics Arts + and the Ricoh Pro C901S Graphics Arts +. 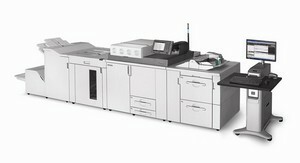 These presses incorporate the new E42 and E82 print servers from EFI. Among several new features, we find a HyperRIP which increases performance by processing several pages of a job simultaneously, and XObject caching, which means the machines can print pdf files containing XObjects at speeds only variable data print jobs attained hitherto. Productivity is substantially improved with a duty cycle raised to 700,000 pages, or 20 % up. Also, media up to 350 g/m² can be handled by these machines. Lastly, the Pro 901S Graphic Arts + also has a high-speed full color scanner, and the feeder allows different settings for different applications.